Hives, which is medically referred to as urticaria, is not contagious by any means. Hives are a skin disorder that results in red, sometimes itching patches of raised skin. The patches of skin can be small or large, and generally appear quite fast and disappear on their own within a couple of days or within a couple of hours with the right OTC treatment. Hives can be as small as a few millimeters and as large as inches, and can even join together to become large areas called plaques. Hives that join together all over your body are generally known as body hives. These are quite itchy in nature and can produce a burning sensation. Hives are an allergic reaction to something you have come into contact with at one point or another. You could have touched a new plant, used a new detergent or soap, even medications you are taking can cause hives. They can also be caused by too much stress in your life - this is known as stress hives. Since no two people have the same reaction to an allergen, hives are not contagious. Hives occur when your body thinks there is something there that it does not agree with, called an allergen. The immune system then releases what are called histamines into the blood stream to attack the allergen and make it go away. In turn, to let you know there is a problem, your body breaks out in these small red and itchy sometimes burning bumps or raised areas. This allergic reaction cannot be given to other people or caught from someone else. The only way you could get hives from someone else is if they had your allergen in their hand and rubbed it on you. For example, if you were allergic to a specific soap, another person would have to rub that soap on you for you to get hives. But you still did not catch hives from that person, you got them from the soap. There is no way to catch or give hives to someone else from an existing case of hives. This is true of all hives outbreaks, including chronic hives and viral hives. You can still use the same wash cloths or towels, sit on the same toilet seat and use the same lotions as someone who has hives. Hives are not contagious because they are a personal allergic reaction. Since hives can occur due to medications, exercise, overexertion, sweating (see heat hives), foods and many other things, sometimes there is no known cause for certain cases. You may undergo extreme amounts of testing and still not know what caused your hives. But you can be certain that you cannot give it to your friends, family or pets by being around them or touching them. Hives can occur on any part of the body including your tongue, ears, lips or face (known as facial hives). Hives can move from one area to another within minutes, and can disappear and reappear within hours. There are a few kinds of urticaria or hives, and none of them are contagious by any means. If you are still scared of giving or getting hives from someone else, the usual treatment for hives will help you rest easy. 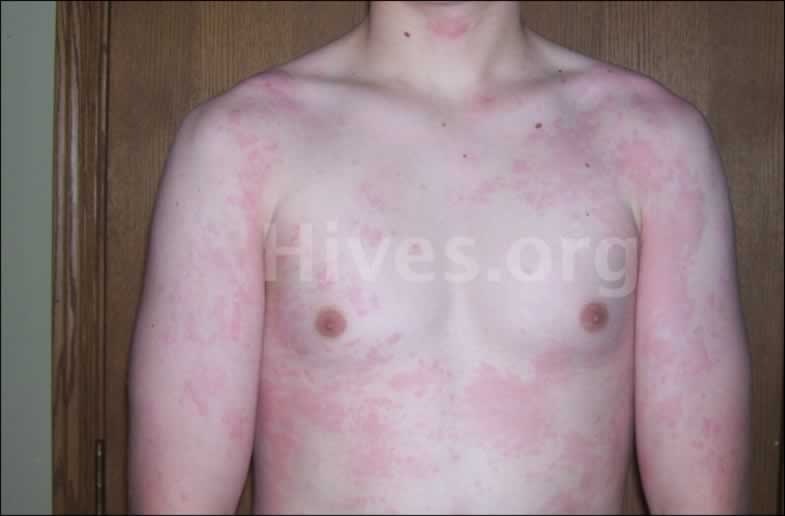 The following pictures are from other people that got a rash from hives, including stress hives, viral hives, chronic hives and facial hives. stress. 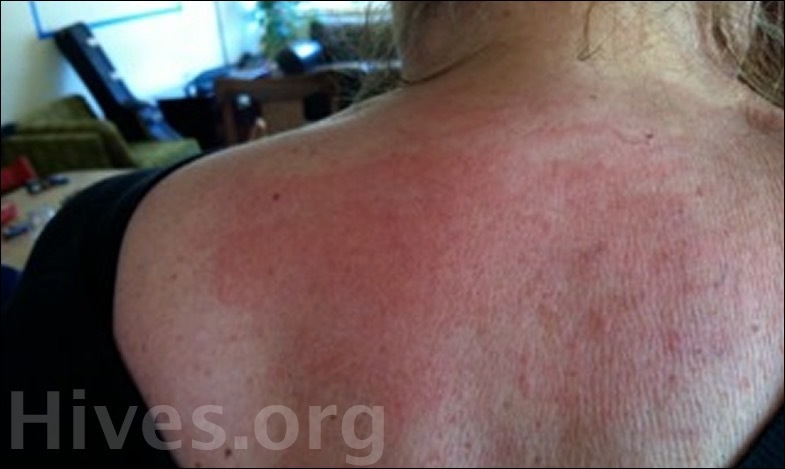 While hives is very common, it is curable. If none of these pictures look like your hives outbreak, please keep in mind that everyone's hives rash will look different.